InicioTOEFLToefl listening sample including a full transcript with questions 3. Curso TOEFL Lección 9 – Toefl listening sample including a full transcript of the text. Each TOEFL listening sample is either a lecture or a conversation. A lecture lasts between 3 and 5 minutes with 6 questions per lecture. You will have 4 to 6 lectures in the listening test. 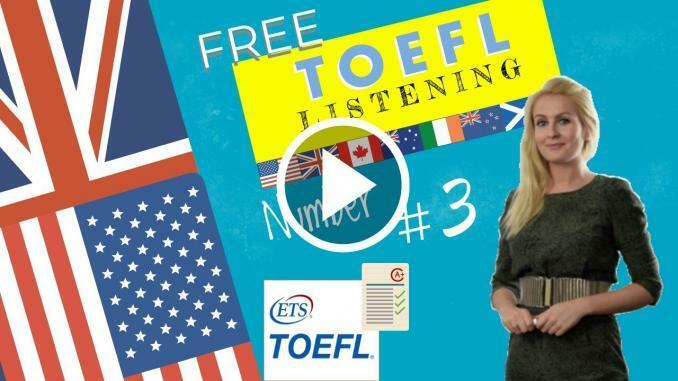 Please listen to each Toefl listening sample and reply to the questions. Today will provide you with Listening tips. In most cases, the first question after each lecture is a main idea question also known as the “gist” question. At the beginning of a listening lecture, the professor “usually” mentions what the main topic of the lecture is be about, but sometimes the topic might be refined into something more specific. The topic can evolve, so look out any new topics. Sometimes you’ll be asked questions regarding the speaker’s attitude or opinion. To answer these questions correctly, you have to listen to the tone of voice of the speaker. Does the speaker sound annoyed, excited, confused, sad…etc? Listen out for how the ideas are connected throughout the lecture. Listen out for key points not specific details. TOEFL listening questions will not test you on small details. For example, you won’t see questions that are about a specific year, name, or location. Instead, questions will test your understanding of key points mentioned in the lecture. Listen for signal words that indicate different parts of the lecture. “Signal words” give hints about what is about to happen in what you’re reading. Understanding them is a key to comprehension. Reading and making up examples which use them is a good way to understand them. So far we have have been looking at…. Now I’d like to…. These words show the order of ideas. As each listening passage starts, the narrator will inform you of the main topic of the academic talk or dialogue so you have a slight idea of what to expect. No matter what the topic is, you should be able to understand what the main idea of the passage is. This is what this question type expects you to answer. Almost all of the prompts will include the word “mainly” in it so this type is easy to identify. Narrator: Listen to part of a lecture from a chemistry class. Professor: Ok, put away your lab coats please. Today we’re going to cover a bit of history. Yes, yes, I know, this is a chemistry class, not a history class, but we’ll be talking about the history of that most famous of chemical diagrams, the periodic table of elements. Open up your textbooks to page 143. To understand where the table comes from, first we need to look back to when the Greek philosopher Aristotle proposed that everything is divided into four main elements: earth, fire, air, and water. Although it doesn’t sound very scientific to us now, Aristotle was actually closer to describing the four states of matter than he was in pinpointing the elements. I mean… solid, liquid, gas, and plasma. Nevertheless, Aristotle’s initial classification of matter into four main types laid the groundwork for future scientists to ultimately discover and understand the properties of all of the individual elements we know today. The discovery of elements was a gradual process, with many different scientists having a hand in the discoveries. For example, in 1669 and 1680, both Hennig Brand and Robert Boyle independently discovered phosphorus. In 1789, Antoine Lavoisier published his Treaty on the Chemical Elements, in which he defined for the first time what an element actually is, and included a list. The list continued to grow. As more and more elements were discovered, scientists around the world searched for a way to classify them. Now, they knew that elements interacted with each other in predictable ways. Several different methods to classify the elements were proposed. The first to notice a pattern within the elements was the chemist Johann Dobereiner. In 1829, he proposed a system called the Law of Triads in which he arranged the elements according to their atomic mass in groups of three. Then, in 1862, French geologist A.E. Beguyer de Chancourtois noticed that when ordered by atomic weights, similar elements would occur with a certain regularity. This characteristic is known as periodicity. Chancourtois used this discovery to classify the elements into a spiral form based on weight, which he published in 1862. It was the first actual written classification of the elements (therefore you could technically call it the first periodic table) although it was largely ignored at the time. Turn to page 144 for an excerpt. In 1863, John Newlands created a system he called the Law of Octaves. He compared his method of classification to that of musical octaves, saying that at intervals of eight, elements show repetition in chemical and physical properties. Newlands grouped the 56 known elements into 11 groups. His system was also not widely accepted. It was a Russian who ultimately solved the puzzle. Dmitri Mendeleev published in 1869 what is now considered the first accurate periodic table of elements. His paper was called On the Relationships of the Properties of the Elements to Their Atomic Weights. He arranged all the known elements by atomic mass (65 at the time) but… and this is important… not exclusively. In order to fit with their recurring chemical and physical properties, some elements had to be moved to places where their mass did not match up. He tidied up the work of his predecessors and contemporaries (correcting mistakes in atomic mass and such) to make his table more accurate, but some elements were still not listed according to their mass as he and his contemporaries believed they should be. So, Mendeleev went on to predict the discovery of several new elements, which he saw as gaps in his chart. He even left the blanks in his published copy. He plotted all the known elements based on their recurring – or periodic – characteristics, and because of this he was able to even predict the properties of the missing elements. And, for the most part, he was right. His table had more rows than previous attempts at classification, which highlighted related elements’ recurring characteristics by placing them in the same column. Interestingly, a German chemist named Lothar Meyer produced, completely independently of Mendeleev’s work – a very similar periodic table. Unfortunately for him though, it was published the year after Mendeleev’s and so Mendeleev is generally credited with creating the periodic table. Mendeleev’s periodic table became the accepted method of classification of the elements, but there have been some changes made since. When the noble gases were discovered in the late 1800’s, these were added to the table in their own group. And as atomic science progressed, more information has been added to each of the elements. Scientists such as Rutherford, Moseley, and Bohr all contributed significantly to the understanding of elemental properties on an atomic level. Glenn Seaborg, an American scientist, helped to discover the transuranic elements in the 1940’s and has an element named after him… Seaborgium, element 106. En la mayoría de los casos, la primera pregunta después de cada conferencia es una pregunta sobre la idea principal también conocida como la pregunta “esencial”. Al comienzo de una conferencia de comprension auditiva, el profesor “usualmente” menciona de qué se trata el tema principal de la conferencia, pero a veces el tema puede ser refinado en algo más específico. El tema puede evolucionar, así que mira cualquier tema nuevo. A veces se te harán preguntas sobre la actitud u opinión del hablante. Para responder estas preguntas correctamente, debe escuchar el tono de voz del hablante. ¿El interlocutor suena molesto, emocionado, confundido, triste… etc? Escucha cómo las ideas están conectadas a lo largo de la conferencia. Al escuchar una conferencia, tome nota de la forma en que las ideas de la conferencia están conectadas. En otras palabras, cómo el profesor organizó la conferencia. Cuando encuentres una pregunta que le pregunta cómo está organizada la conferencia, puedes consultar tus notas. Algunas de las principales relaciones entre ideas incluyen causa / efecto, comparar / contrastar y pasos en un proceso. Escucha los puntos clave, no los detalles específicos. Las preguntas de escucha de TOEFL no te pondrán a prueba en pequeños detalles. Por ejemplo, no verás preguntas sobre un año, nombre o ubicación específicos. En cambio, las preguntas pondrán a prueba tu comprensión de los puntos clave mencionados en la conferencia. Escucha las palabras de señal que indican diferentes partes de la conferencia. Para ayudarte a captar los puntos clave de la conferencia, debes aprender a escuchar palabras de transición. Estas palabras son como las señales de tráfico que te dicen lo que vendrá después. Las palabras de señal pueden indicar el comienzo o el final de un tema. También pueden ayudar a avanzar a mitad de la conferencia mediante la introducción de temas. Las “palabras de señal” dan pistas sobre lo que está por suceder en lo que estás leyendo. Entenderlas es una clave para la comprensión. Leer y crear ejemplos que las usen es una buena forma de entenderlas. A medida que cada pasaje de escucha comienza, el narrador te informará sobre el tema principal de la charla o diálogo académico para que tengas una ligera idea de qué esperar. No importa cuál sea el tema, debes ser capaz de entender cuál es la idea principal del pasaje. Esto es lo que este tipo de pregunta espera que respondas. Casi todas las indicaciones incluirán la palabra “principalmente” en ella, por lo que este tipo es fácil de identificar. Narrador: escucha parte de una conferencia de una clase de química. Profesor: Vale, guardad las batas de laboratorio por favor. Hoy vamos a cubrir un poco de historia. Sí, sí, lo sé, esta es una clase de química, no una clase de historia, pero estaremos hablando de la historia de los diagramas químicos más famosos, la tabla periódica de elementos. Abrid los libros de texto en la página 143. Para entender de dónde viene la tabla, primero debemos mirar hacia atrás cuando el filósofo griego Aristóteles propuso que todo está dividido en cuatro elementos principales: tierra, fuego, aire y agua. Aunque ahora no nos parece muy científico, Aristóteles estaba más cerca de describir los cuatro estados de la materia que de señalar los elementos. Quiero decir … sólido, líquido, gas y plasma. Sin embargo, la clasificación inicial de Aristóteles de la materia en cuatro tipos principales sentó las bases para que los futuros científicos descubran y comprendan finalmente las propiedades de todos los elementos individuales que conocemos hoy. El descubrimiento de elementos fue un proceso gradual, con muchos científicos diferentes participando en los descubrimientos. Por ejemplo, en 1669 y 1680, tanto Hennig Brand como Robert Boyle descubrieron independientemente el fósforo. En 1789, Antoine Lavoisier publicó su Tratado sobre los Elementos Químicos, en el que definió por primera vez qué es un elemento es realmente, e incluyó una lista. La lista continuó creciendo. A medida que se descubrieron más y más elementos, los científicos de todo el mundo buscaron la forma de clasificarlos. Ahora sabían que los elementos interactuaban entre sí de maneras predecibles. Se propusieron varios métodos diferentes para clasificar los elementos. El primero en notar un patrón dentro de los elementos fue el químico Johann Dobereiner. En 1829, propuso un sistema llamado la Ley de Tríadas en el que ordenaba los elementos según su masa atómica en grupos de tres. Luego, en 1862, el geólogo francés AE Beguyer de Chancourtois notó que cuando se ordena por pesos atómicos, elementos similares ocurrirían con cierta regularidad. Esta característica se conoce como periodicidad. Chancourtois usó este descubrimiento para clasificar los elementos en una forma espiral basada en el peso, que publicó en 1862. Fue la primera clasificación escrita de los elementos (por lo tanto, técnicamente podría llamarse la primera tabla periódica), aunque en gran medida se ignoró en ese momento. Vayan a la página 144 para un extracto. En 1863, John Newlands creó un sistema que llamó la Ley de Octavas. Comparó su método de clasificación con el de las octavas musicales, diciendo que a intervalos de ocho, los elementos muestran repetición en las propiedades químicas y físicas. Newlands agrupó los 56 elementos conocidos en 11 grupos. Su sistema tampoco fue ampliamente aceptado. Fue un ruso quien finalmente resolvió el rompecabezas. Dmitri Mendeleev publicó en 1869 lo que ahora se considera la primera tabla periódica precisa de elementos. Su artículo fue llamado las relaciones de las propiedades de los elementos con sus pesos atómicos. Organizó todos los elementos conocidos por masa atómica (65 en el momento) pero … y esto es importante … no exclusivamente. Para encajar con sus propiedades químicas y físicas recurrentes, algunos elementos tuvieron que moverse a lugares donde su masa no coincidía. Arregló el trabajo de sus predecesores y contemporáneos (corrigiendo errores en masa atómica y cosas por el estilo) para hacer su tabla más precisa, pero algunos elementos aún no estaban listados de acuerdo a su masa como él y sus contemporáneos creían que deberían ser. Por lo tanto, Mendeleev pasó a predecir el descubrimiento de varios elementos nuevos, que vio como lagunas en su tabla. Incluso dejó los espacios en blanco en su copia publicada. Trazó todos los elementos conocidos basándose en sus características recurrentes o periódicas y, debido a esto, pudo incluso predecir las propiedades de los elementos faltantes. Y, en su mayor parte, él tenía razón. Su tabla tenía más filas que los intentos previos de clasificación, que resaltaban las características recurrentes de los elementos relacionados colocándolos en la misma columna. Curiosamente, un químico alemán llamado Lothar Meyer produjo, con total independencia del trabajo de Mendeleev, una tabla periódica muy similar. Desafortunadamente para él, sin embargo, se publicó el año después de Mendeleev, por lo que a Mendeleev generalmente se le atribuye la creación de la tabla periódica. La tabla periódica de Mendeleev se convirtió en el método aceptado de clasificación de los elementos, pero se han realizado algunos cambios desde entonces. Cuando los gases nobles se descubrieron a finales de 1800, estos se agregaron a la tabla en su propio grupo. Y a medida que avanzaba la ciencia atómica, se agregó más información a cada uno de los elementos. Los científicos como Rutherford, Moseley y Bohr contribuyeron significativamente a la comprensión de las propiedades elementales a nivel atómico. Glenn Seaborg, un científico estadounidense, ayudó a descubrir los elementos transuránicos en la década de 1940 y tiene un elemento que lleva su nombre … Seaborgio, elemento 106.